There are 17 Assisted Living Facilities in the Chippewa Falls area, with 5 in Chippewa Falls and 12 nearby. The average cost of assisted living in Chippewa Falls is $3,687 per month. This is higher than the national median of $3,346. Cheaper nearby regions include Menomonie with an average starting cost of $3,687. To help you with your search, browse the 28 reviews below for assisted living facilities in Chippewa Falls. On average, consumers rate assisted living in Chippewa Falls 4.3 out of 5 stars. Better rated regions include Eau Claire with an average rating of 4.4 out of 5 stars. Caring.com has helped thousands of families find high-quality senior care. To speak with one of our Family Advisors about assisted living options and costs in Chippewa Falls, call (855) 863-8283. The former lumber town of Chippewa Falls is a vibrant community on Wisconsin's Chippewa River. Local residents have access to a wide range of services and amenities like the 318-acre Irvine Park & Zoo. The community also boasts a network of clubs and organizations, including a local senior center. There are 25 assisted living facilities in the Chippewa Falls area, five within the city boundaries and 20 in the nearby communities of Eau Claire, Bloomer and Altoona. The Wisconsin Department of Health Services is responsible for regulating facilities in the state. While summers in Chippewa Falls are pleasant, with July highs reaching an average of 82 degrees, winters can be very cold, with January lows falling to an average of 5. This could create additional barriers to seniors for getting outside during these months, especially those already living with mobility restrictions. Chippewa Falls is one of the more affordable communities in the U.S., which is helpful to seniors living with low incomes. The cost of living is 9 percent lower than the national average. Wisconsin residents who receive social security benefits are not taxed on this income. There is no mass transit program in the city, but the Chippewa Falls Shared Ride Transit Program is available as a service within the city limits. Passengers aged 65 and older are automatically eligible to apply for reduced fares. Local care facilities may wish to visit the Chippewa Valley Cultural Association, which operates out of the historic Heyde Center for the Arts, for supervised excursions. The association is a resource for creative communities — whether locally based or international — who wish to develop and share their talents. The Chippewa Falls area is home to world-class medical facilities, including St. Joseph’s Hospital, in the event of medical emergencies or illness. Assisted Living costs in Chippewa Falls start around $3,687 per month on average, while the nationwide average cost of assisted living is $4,000 per month, according to the latest figures from Genworth’s Cost of Care Survey. It’s important to note that assisted living rates in Chippewa Falls and the surrounding suburbs can vary widely based on factors such as location, the level of care needed, apartment size and the types of amenities offered at each community. 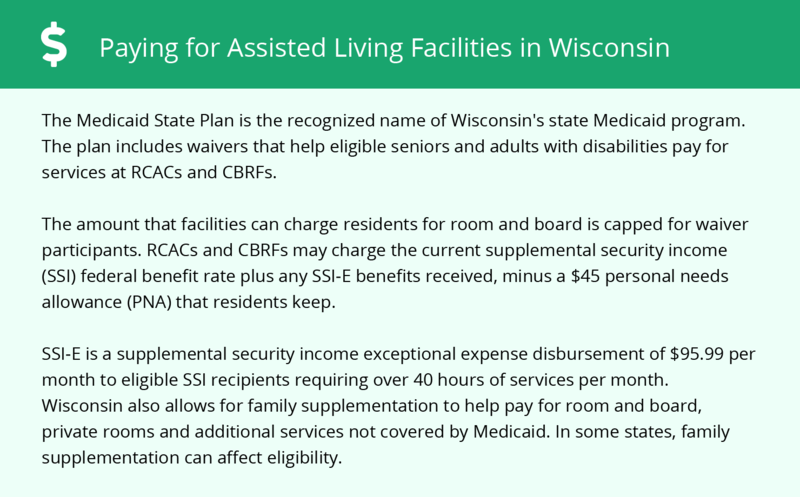 The state of Wisconsin offers Medicaid waivers for assisted living, such as through its Family Care program. 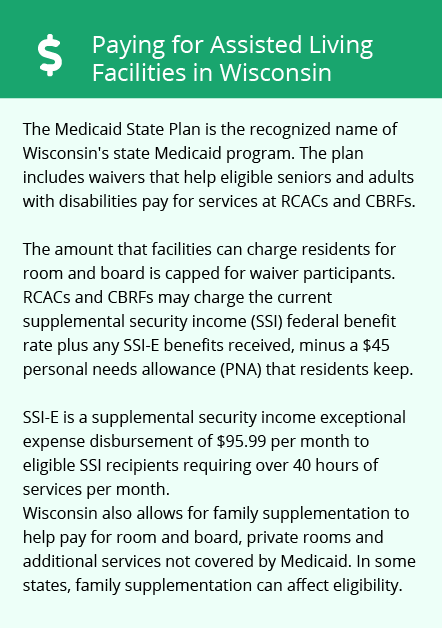 Another assistance program is the Wisconsin SSI Exceptional Expense Supplement (SSI-E), a non-Medicaid state program available to residents of assisted living facilities, also known as residential care apartment complexes (RCAC). Chippewa Falls and the surrounding area are home to numerous government agencies and non-profit organizations offering help for seniors searching for or currently residing in an assisted living community. These organizations can also provide assistance in a number of other eldercare services such as geriatric care management, elder law advice, estate planning, finding home care and health and wellness programs. To see a list of free assisted living resources in Chippewa Falls, please visit our Assisted Living in Wisconsin page. Chippewa Falls-area assisted living communities must adhere to the comprehensive set of state laws and regulations that all assisted living communities in Wisconsin are required to follow. Visit our Assisted Living in Wisconsin page for more information about these laws.